Kathryn says: I had some leftover cooked salmon in the fridge, so I thought it would make for a tasty addition to an egg sandwich. I liked how the salty, flavorful fish and cheese went with the heartiness of the bread. Put one egg, salmon, spinach, mozzarella, salt and pepper in a frying pan over medium-high heat. Mix thoroughly with a fork and cook until egg looks done. 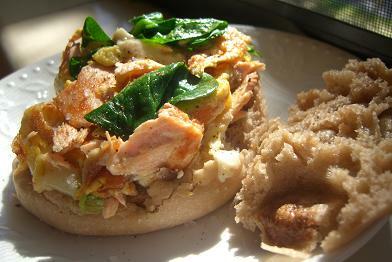 Transfer cooked ingredients from pan onto English muffin. Add ketchup, if you’d like. Kathryn says: I felt like making an extra-heart healthy meal, so I whipped up this dinner up for J and I. She loved it, especially the cranberry mashed potatoes. If you’re looking for something sweet to replace the usual gravy you put on your mashed potatoes as part of a healthy fish-and-veggies meal, read on. Place salmon on large, ungreased frying pan. Cook on medium-high heat and flip to evenly brown both sides. Cook until fish flakes when it is cut and has no raw pink color left in the center. Wash potatoes. Boil in a large pot on medium-high heat until soft when poked with a fork. Serve with cranberry sauce (see below). Place pot on medium-high heat. Stir and cook until desired heat. Wash potatoes. Boil in a medium pot on medium-high heat. Add remaining ingredients and toss. Put garlic and olive oil in medium frying pan on medium-high heat. Stir garlic and cook until lightly browned. Add spinach and stir until spinach wilts. Jamie says: I always choose soft tortillas over hard taco shells for taco night. I prefer the taste of the soft tortilla and like how you can fit so much more into it than those flimsy little corn shells. But, I have to admit the Saucy Shrimp Tostadas recipe in Publix Family Style magazine caught my eye. I liked how aesthetically pleasing the picture was and how you can pile it high with delicious ingredients. By the end of the meal, I was sold on the tostada as an alternate to the steadfast soft tortilla. Preheat oven to 350°F. If shrimp are not defrosted, rinse in a bowl under cool running water. Remove tails from shrimp. On medium heat in a large saute pan, heat cans of tomatoe sauce and no salt added tomato sauce. Add shrimp and taco seasoning mix. Bring to a boil (medium-high); reduce heat to medium-low and simmer for about 6 minutes or until shrimp and sauce is heated, stirring occasionally. Meanwhile, heat black beans in a small pot on medium low heat for about 8 minutes or until warm. Thinly slice lettuce, chop green onion, and cut avocado into bite-sized pieces. Put prepared toppings, sour cream, and salsa in serving bowls. Heat tostadas in preheated oven until warm, about 5 minutes. Assemble tostadas with desired toppings (i.e. 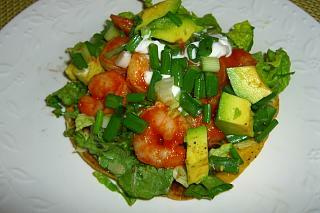 tostada with black beans, salsa, sour cream, lettuce, shrimp and sauce, green onions, and avocado). Serves: 5. Enjoy! A flavorful and fun meal to serve. Crunchy shell, saucy shrimp, and fun toppings. Nutrition note: Taco night doesn’t have to be laden with trans fats. Many brand-name taco seasoning mixes and shells contain trans fats. Read the ingredients section of label for words like “partially hydrogenated” or “hydrogenated” oils. I found the Publix taco seasoning mix and Mission tostadas to be trans-fat free. Jamie says: I’ve been enjoying cooking new recipes lately. I was flipping through the latest Publix Family Style magazine the other day and the Grilled Steak Bruschetta Salad recipe caught my eye (if there was an award for meal presentation, this one would place). As some of you may know, Kathryn and I don’t eat red meat, so I used lean pork instead and made some additional modifications, which I think were for the best, of course. Preheat oven to 350° F. Place pork roast on a baking sheet, and sprinkle both sides with salt and freshly group pepper. Bake for about 1 hour and 15 minutes, turning once until thoroughly cooked. Meanwhile, prepare creamy apricot dressing; in a medium-sized bowl combine apricot spreadable fruit, yogurt, Dijon mustard, and the juice of one lemon. Cover and refrigerate. When the pork has about 35 minutes left to cook, heat extra virgin olive oil in a large saute pan. Slice plantains into 1-inch pieces on the diagonal. Add plantain slices to the pan, sprinkle with garlic salt and freshly ground pepper and cook for about 25 minutes or until golden and soft, flipping plantains occasionally. Meanwhile, drain and chop roasted peppers and set aside in a small bowl. Thinly slice bread. When pork is cooked, slice it to the desired thickness. 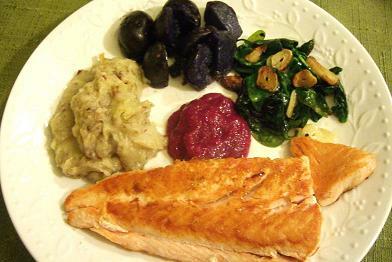 Assemble meal on individual plates- with spinach on the bottom of each plate and a few bread slices on top of the spinach. 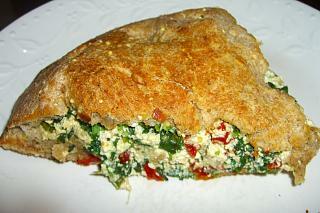 Top each slice of bread with pork then roasted peppers and Gorgonzola cheese. Drizzle dressing over bread and spinach. Assemble plantains on the side of the plate. Serves 6. Enjoy! The presentation is beautiful! With bright red, yellow, and green, you’ll be sure to “Eat Right with Color” (American Dietetic Association’s theme for National Nutrition Month this year). The flavors are bold and will make your taste buds dance. The leftovers are great for lunch, too. Nutrition note: Most jellies and jams are made with high fructose corn syrup, sugar, and/or artificial sweeteners. But you don’t have to settle. Look for spreadable fruits that are made with fruit juice and fruit, i.e. Polaner All Fruit with Fiber apricot spreadable fruit (this one also has the benefit of added fiber). Peel and segment an orange. Sprinkle with cinnamon. Serves: 1. Enjoy! 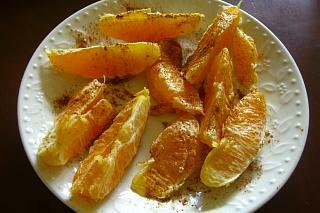 The addition of cinnamon makes a simple snack become a special treat. Nutrition note: Try snacking on fruits and vegetables for a healthy mid-day boost. Jamie says: I made my first calzone! I found the recipe in Eating Well magazine. This wasn’t just any calzone, though. The recipe calls for tofu. If you’ve never had tofu or are a little skeptical of it, give it a try (or second try). You may be surprised by how it takes on the flavors of the other ingredients in the meal and how good it can be. Preheat oven to 475°F. Coat a large baking sheet with no-stick cooking spray. Drain tofu by firmly pressing paper towels on it (it’s ok if it crumbles, it’s better to get the moisture out). Place tofu in a large bowl. If spinach is not thawed, microwave it until is, and then add it to the large bowl. Add sun-dried tomatoes, Parmesan cheese, mozzarella cheese, basil, onion powder, salt, and pepper. Use hands to mix well. Spread dough out on the baking sheet. Spread the mixture from the large bowl onto half the dough. Fold over the dough to make a pocket. Pinch the edges closed with a fork to seal. Using a knife, make several small slits in the top of the dough. Spray with non stick cooking spray. Bake for 20 minutes or until browned on top. About 3 minutes before calzone is done, pour sauce in a microwave-safe bowl and heat for about 2 minutes or until hot. 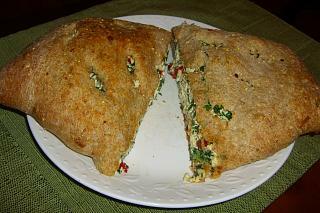 Slice calzone in half. Serve with sauce on the side. Serves: 2-4. Enjoy! Wow! Great dinner! Kathryn was so impressed, too. The multi-grain crust was crisp and had a nice nutty flavor. The filling with the warm tofu crumble was moist and delicious- the spinach and sun-dried tomatoes imparted a nice, strong flavor. Nutrition note: The tofu in this recipe is a great substitute for ricotta cheese because tofu is lower in calories, higher in protein, and lower in fat that full-fat cheese. 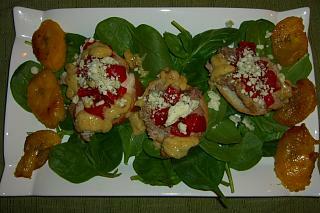 We also shared this recipe on The Independent Florida Alligator’s web site. Heat a large frying pan on the stove top over medium-high heat. Spray with cooking spray, and add the pear to the pan. Sprinkle with sugar. Cook 2 minutes on each side or until golden and set aside. Cut bread in half horizontally. Brush cut sides of bread with vinegar. 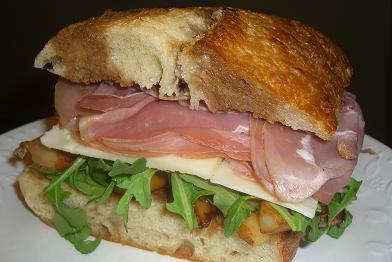 Arrange pear slices, arugula, cheese, and prosciutto evenly over bottom half of bread; cover with top half of bread. Reheat large pan on medium heat. Add the sandwich to the pan and place a heavy pan or plate on top; press gently to flatten. Cook 4 minutes per side or until bread is toasted, keeping the heavy pan on top while it cooks. Cut in half and serve hot.